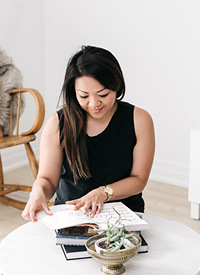 Fab Finds via Style at Home — Love On Sunday Love On Sunday | Interior Styling in Toronto and the GTA. Some of you may remember this cabinet I was lusting over. It was part of my Snowy Furniture Friday post back in February. I spotted this beauty at a local consignment shop called The Singing Lady. I was so in love with the piece but decided against it because of the lack of space in our condo. I still can't believe it! I'm pretty sure it's the exact same piece and I just LOVE what they did with it. The fresh coat of white paint and silvery finish on the medallions really make this piece stand out against the dark wall. I also love how they've paired it with some sleek and modern neutral chairs and of course the Souk wool rug from West Elm which seems to be on everyone's wish list right now. Gorgeous! If you haven't seen the June issue of Style at Home yet, I suggest you take a quick look. I just love this feature on Fab Finds and how to decorate on a budget. I love how a fresh coat of paint and some minor touch ups can restore an old piece back to it's original glory. Do you have any furniture pieces you would like to restore or have you stumbled across any fab finds lately?